The TKM-100 features a collet that can accommodate all three size tubular keys. No fumbling with changing jaws or adapters. Simply tighten the chuck closer - the self adjusting collet easily accepts any size key (Diameter .365 - .406). Probably more than any other type of key, a tubular key wears very quickly. Due to the constant pressure on the face of the key, even original keys can be off .001” - .003”. By using a duplicator to make a key, an inaccurate copy of a worn key is being made. When you use the TKM-100 to code cut a key, you’ll be making an original key, accurate to .001”. 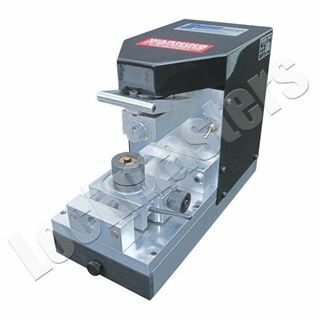 A precision dial indicator is included with the machine, which enables you to decode a tubular keys for duplication. Decoding takes only a few seconds.